Brookhaven was developed in 1911 by the Mechanical and Manufacturers Club, who hired Long Island golf pro Herbert H. Barker to design a nine-hole course on the property. A year later, the Brookhaven Country Club opened as Atlanta’s second golf course (after East Lake in 1906). Atlanta’s Capital City Club purchased the Brookhaven Club in 1915 and expanded the golf course from nine to 18 holes. The clubhouse was finished in 1928. The clubhouse and the community are both listed on the National Register of Historic Places, and the community is a National Historic District. Many homes were designed by well-known Atlanta architects of the period including Neel Reid and Hal Hentz. Today, many Brookhaven residents choose to live in Brookhaven because of its country club lifestyle and proximity to Atlanta’s finest shopping, including Phipps Plaza. Capital City Club: Capital City was founded in 1883 and is “one of the most prestigious social clubs in America.” The club is comprised of three facilities. The City Club is located in downtown Atlanta, and offers fine dining and beautiful event halls. The Country Club is located in Brookhaven. It underwent a major renovation in 2008/2009 which added more fitness facilities, outdoor dining areas and a completely renovated Tom Fazio designed golf course. Capital City’s third facility, the Crabapple Golf Course, was built in 2002. Located in Woodstock, this course, also designed by Fazio, hosted the American Express Championship in 2003. Theater at Oglethorpe University: The Theater at Oglethorpe University is home to Georgia Shakespeare Theater, which puts on numerous productions throughout the year. Oglethorpe University Museum of Art: The Oglethorpe University Museum of Art offers exhibitions such as Salvador Dali and Maurice Utrillo. They also offer art camps and workshops throughout the year, as well as a lecture series. Peachtree Dekalb Airport: PDK opened in World War II as Naval Air Station Atlanta. Between 1957 and 1959 it was converted to civilian use. Today it is a general aviation airport that services many private planes. Ashford Park: Three acre park offering basketball, tennis and playground. Blackburn Park: 49-acrea park offering tennis, basketball courts, soccer fields, trails and picnic tables. 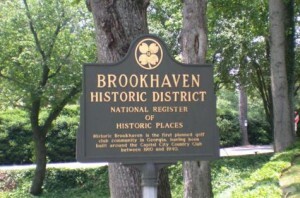 Brookhaven Park: Nine-acre park offering sports courts, picnic tables, playgrounds and trails. Keswick Park: 45-acre park on the edge of Brookhaven. Murphey Candler Park: 135-acre park offering lake, pool, football and baseball.